Hurricanes, cyclones and typhoons are all types of tropical storms. But what's the difference between them? Well, they are all basically the same thing, but are given different names depending on where they appear. When they reach populated areas, they usually bring very strong winds and rain which can cause a lot of damage. 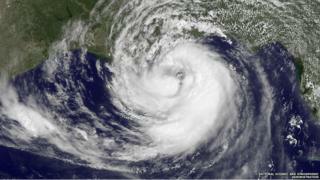 Hurricanes are tropical storms that form over the North Atlantic Ocean and Northeast Pacific. Cyclones are formed over the South Pacific and Indian Ocean. Typhoons are formed over the Northwest Pacific Ocean. Tropical storms last a long time and are given names so they can be identified quickly. In most places, the first storm of a year will have a name beginning with A, such as Hurricane Alice, and the next one gets a name beginning with B. Weather scientists hold meetings to decide on new names for the next year. Names of storms which cause a lot of damage are never used again. What happens in a tropical storm? As the air cools down again, it is pushed aside by more warm air rising below it. This cycle causes strong winds. Tropical storms have winds faster than 73 miles an hour. 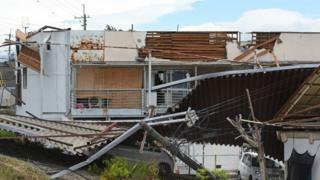 What damage do tropical storms cause? 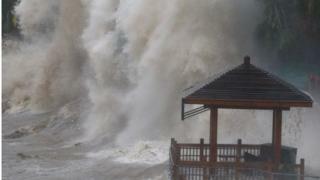 Over the sea, a tropical storm can whip up huge waves. Over land, the strong winds can cause a lot of damage - they can flatten homes, knock over trees and even tip over cars. Tropical storms usually die out after a few days over land because there is no warm sea water there to power them. In times of great danger - perhaps following a natural disaster like a cyclone - the government can declare a state of emergency. This means the government stops performing its day-to-day duties and instead focuses on solving the situation.